Yes, I know I'm late again. FWIW, I was kinda waiting to see how things shook out with our conversion to the new site before posting a BOTM. Anyway, thanks to a suggestion from a fellow SB member, the BOTM this month is WTRB. I have to admit that I'm not much of a fancier of WT products. However, WTRB is one that I have enjoyed. Operative word here, have. It's been quite a while since I've had a bottle on my shelf, or in my cabinet. I liked the older 108.2 proof WT-03RB well enough, and purchased a bottle here and there. A few years ago, I found a store that received some 700 ml Japanese export bottles by mistake, and I purchased some of those on a few different visits to that store. Same 03RB, different bottle. I was also lucky enough to have tried at least a couple of the earlier versions. Once upon time, I even managed to snag a couple of older 375's of W-T 01-99. They were great. I have yet to try the new 112.8 bottling. I reckon that since it's the BOTM, I just might have to grab a bottle if I can find one. Cheers and happy posting! Let's here what y'all have to say about WTRB. Rare Breed is my favorite regularly produced WT product. 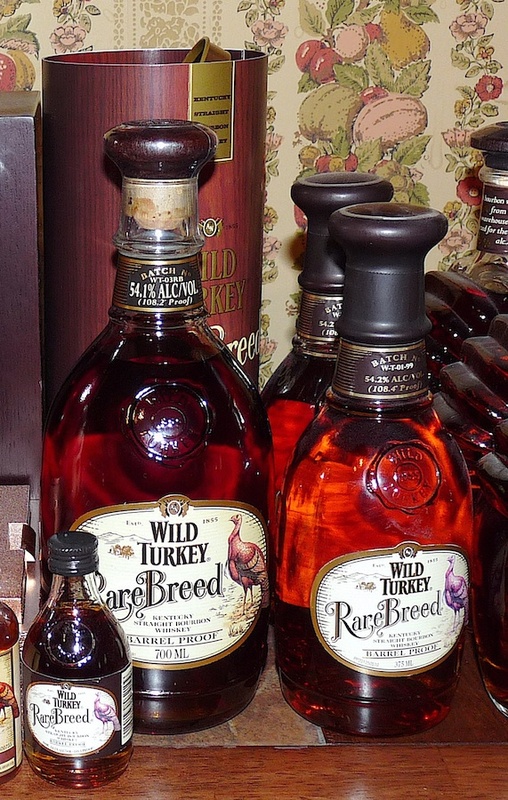 Rare Breed was my re-entry into bourbon and my entry into higher quality bourbons nearly 25 years ago. I wish I would have started a bunker then rather than a dozen years later. You all leave me with nothing more to say. Excellent! We can post in here now. I'll echo the others - this is my favorite Turkey also. RRSB can be better but not always due to single barrel variation. Given its price, Rare Breed is consistently the better value while giving up nothing in quality. I always have one on hand. I dunno. The older 108.2 proof was fine, but I like the WT101 and 101RYE better, and I don't have to add ice or water to the 101s avoid heartburn like I do with both the 03-RB and especially the 04-RB (112+? - bottle's not near me so I'm working on memory). But like Steve, I always have an open one of each on the shelf, and when they're gone, I get replacements. I always have a bottle on my bar. I don't find myself going to it often, but every time I do I wonder why I don't go to it more often. Good stuff. I still have some of the 108 proof, haven't tried the 112. It's also my favorite pour coming out of the WT distillery. My bottle is nearly empty, going to have to go out hunting to see if I can find another 108 if what I read from other SBers about the 112 is correct. Wish I could find a 50ml of the 112 to try, but don't seem to be any around me. The 112 is good too, albeit a little younger and with more char on the finish. It's very sweet with a great mouth-feel though. It's a little like the differences between the old 8 Year 101 and the new stuff. I like the newer 112 better than the 108. Really nice oak and spice with a good kick. Great stuff! That being said I'm glad I still have a couple bottles of the original 01-91 as that is some of the best bourbon I've ever had. I think that too much is made about the difference between the 108 and 112. Individual palates vary for sure, and those who prefer the 108 need to follow their palate. But just as many seem to prefer the 112 or believe the difference is minimal. I've had both and like both just fine. There's no risk, in my opinion, from buying a bottle of the 112. Even if you find you prefer the 108 I highly doubt that you will dislike the 112. Fully agree, Steve, re: minimal difference. VAGen's post mentions the reason for my preferring the 108 over the 112 - the, to me, extra oak in the 112. But, I do keep at least one of each on hand, and both of them are open. What price are you finding these in your area? I see them around $40 / fifth here. In the DC-MD-VA area (including VA's ABC Stores), both are $42 (sale price) to $50 (a few stores) per 750. WTRB 112 is the only Wild Turkey product I have had the pleasure of tasting. I must say, the nose packs quite a punch of alcohol, but once you get past that and the first bite on the tongue, the palate and finish are like a nice, warm, honey syrup that coats your throat and lingers. I appreciate the fact that it sells for $40 in these parts - a decent price for a barrel proof bourbon that delivers the goods. I have one bottle open, and another sitting in the wings. Big fan of Rare Breed. I'm another one that prefers the 112 over the 108. The 108 seemed a little thinner, and the 112 just a bit sweeter. Thru out the years I've always thought that it was a lot better pour and worth the extra money than the standard WT101. Truth be told, nowadays I find myself pouring RR Single Barrel a lot more than RB. But it's still a solid pour and one of the bourbons I always have on hand. I love the stuff. There's a little bit of depth missing from the new bottles, but they make up for it in spicy kick. I still have one store left that sells it for $30, but I doubt that will last much longer. Great value pour and just barely under the line where I feel compelled to add water. Whoa! I can see being a little less enthused about it at those prices. Here, there's one store I can get it for $28. The prevailing price elsewhere is $34. I just sampled a pour at a restaurant we ate dinner at, and I really enjoyed it. I will have to pick up a bottle. I could barely taste the alcohol, which surprised me. I like sweet, so this hit the spot for me. It wasn't all about sweetness either, which was very nice.i also tried an ewsb and a sazerac rye, and those were disappointments. The ewsb suffered though because I started with the rb.